While I’m writing, I’m in the tropical garden of Casa Asia, our guesthouse in the Bukit peninsula, in Bali. Now, I have been traveling for two weeks together with my partner, and despite the wonder of discovering every day new places, walking or riding on unknown roads, and eating out every evening in a new place, in this moment what I’m missing most is some simple homemade food. Comfort food. A trendy term, that hides the real function of food. In my opinion, comfort food is the food that cheers me up on a bad day, that warms me when I’m cold, that lets me feel cocooned at home. And that’s the one I miss most when I travel. Comfort Food is the topic of this month’s Cucina Conversations, and It couldn’t be more appropriate, since now I have been traveling for two weeks, and I’m really missing some comfort food. 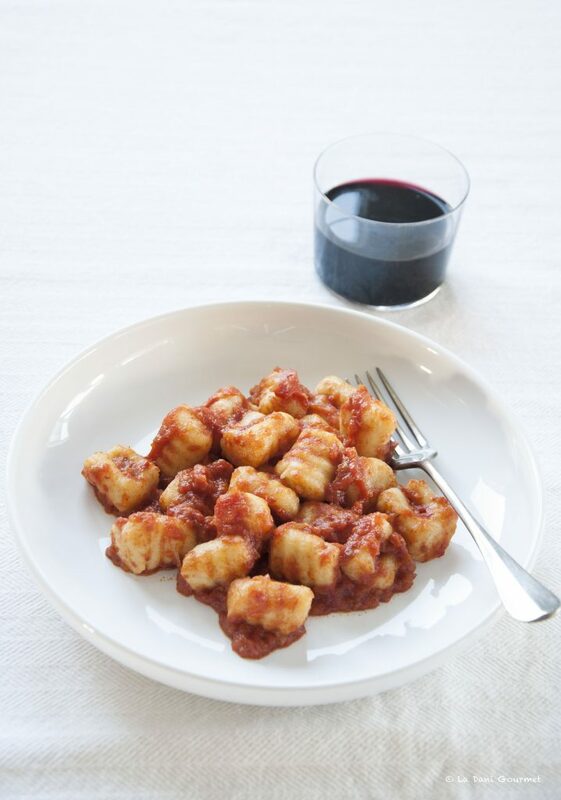 Before leaving for this trip in South-East Asia, I’ve prepared what has always been a favourite comfort food, since when I was a child: potato gnocchi. I have clear memories of my nonna and my mother boiling potatoes, smashing them with care, adding some nutmeg and salt, and finally kneading together with some flour. How much I loved, already as a child, to roll out the gnocchis – which were never small at my place – on a floured fork. The only sauces used were homemade tomato sauce or butter and sage with parmesan. This time I chose a simple pummarola, the one I prepare during summer with the tomatoes from my garden (and the one I’m looking forward to eat again, once back home). 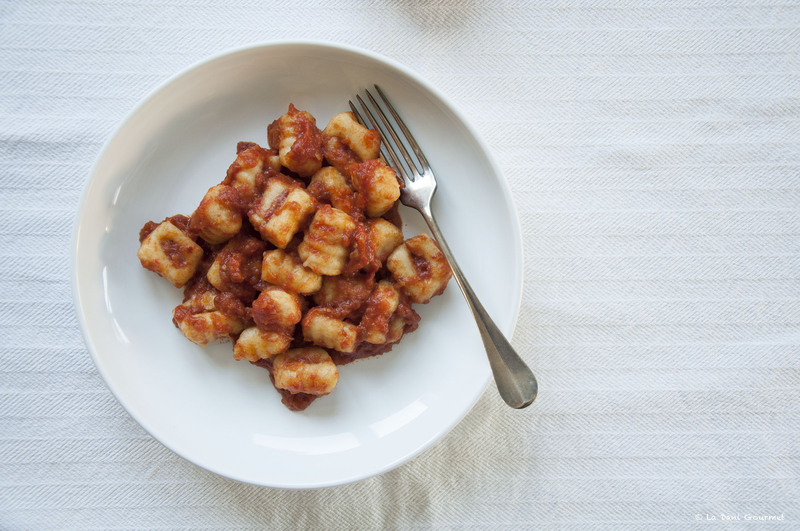 The secret to make the best gnocchi are potatoes. You have to chose the correct type, better the red skin ones or the white potatoes, and they don’t have to be new. New potatoes are really starchy, and they could comprise the texture of the dough. It’s also important to cook potatoes in the correct way. They don’t have to absorb water; so I prefer to steam them with the skin on. 1.Wash the potatoes and steam them, with the skin, until they turn soft. It will take about 40 minutes, but it depends on their size. 2.Peel them off and pass the potato through a potato masher, directly on a wooden board. Season with salt and some grated nutmeg and start combining together with 3/4 of flour. Add the rest of flour (if needed, a bit more than the quantity I indicated), if the dough is too sticky. Knead quickly and and let the dough rest for 5 minutes, covered with a plate. 4.Cut the log into 2-3 cm pieces, and roll each piece onto a floured fork. Continue until you finish the potato dough, and place the prepared gnocchi on a tray generously floured with semolina. Cover the trays with a rag, until you’re ready to cook them. 5.For the sauce: thinly slice the shallot and let it sauté for 5 minutes in two tablespoons of evoo together with some chilly. Add the tomato sauce, season with salt, and let it cook over gentle heat for about twenty minutes. 6.Bring a large pan of water to the boil, and then add coarse salt. 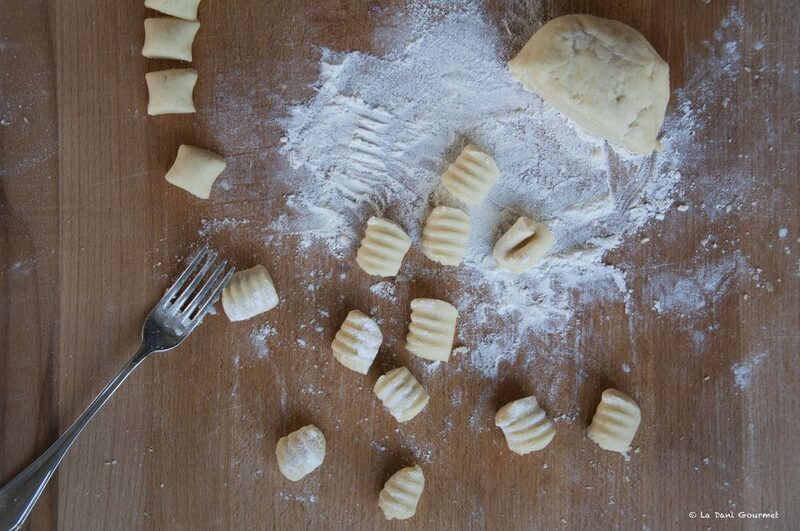 Now cook gnocchi, in small batches at a time. As soon as they float on the surface, wait one minute, and remove them with a spotted spoon and place them in the warm tomato sauce. Continue until you cook all the gnocchi. 7.Serve immediately, with a drizzle of extravirgin olive oil and some basil leaves, if in season. These look so comforting. I know exactly how you feel Daniela with regards to missing a favourite home made dish when travelling. Hope you enjoyed your travels and have rested well. Hi Carmen! Hope you’re well! 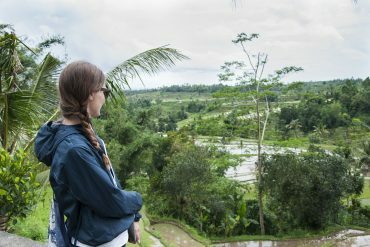 Unfortunately the weather was most of the time bad in Bali, but we tried our best to visit as much as possible. As soon as I recover from the jet lag, I will write a lot about this travel.